Aerial Images Show Destruction Of Ancient Christian Monastery In Iraq : The Two-Way The new images obtained by The Associated Press show the site of St. Elijah's Monastery in the ISIS-held city of Mosul. ISIS likely destroyed the monastery in the fall of 2014. This combination of two satellite images provided by DigitalGlobe, taken on March 31, 2011 (top), and Sept. 28, 2014, shows the site of the Christian monastery known as St. Elijah's, or Dair Mar Elia. 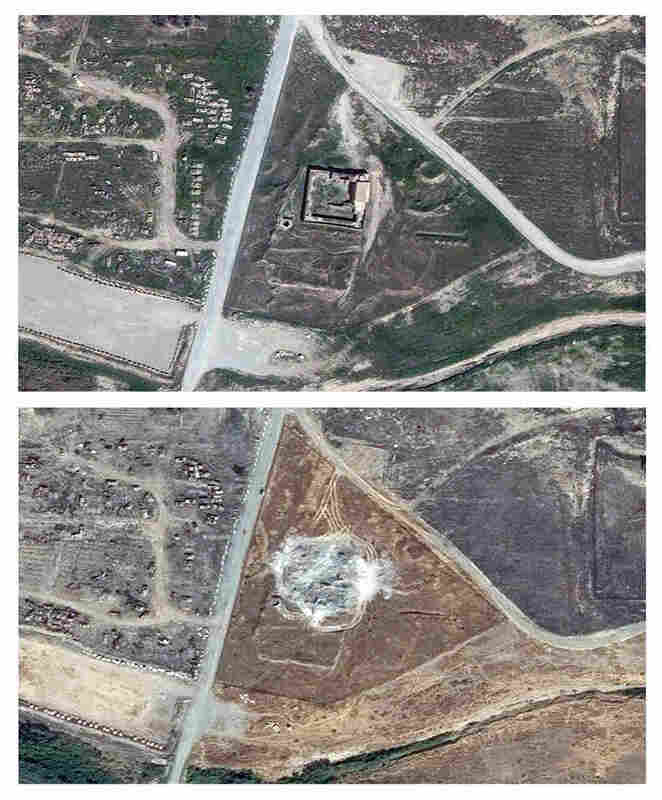 New satellite images of St. Elijah's Monastery, located in the ISIS-held city of Mosul, no longer show a neatly chiseled, square parcel of land, complete with walls and buildings built into a hill. All that can be seen of the Christian monastery, parts of which are 1,400 years old, is a dusty field of rubble. It was apparently razed by ISIS in its quest to destroy religious or historical artifacts deemed heretical. "Satellite images suggest ISIS destroyed it in the fall of 2014," NPR's Alice Fordham reports, adding that this timeline was corroborated by Father Najeeb Mikhael, a priest who fled Mosul to the nearby city of Irbil. "Bulldozers, heavy equipment, sledgehammers, possibly explosives turned those stone walls into this field of gray-white dust. They destroyed it completely," imagery analyst Stephen Wood, CEO of Allsource Analysis, told The Associated Press, which had asked the satellite imagery company DigitalGlobe to take photos of the site. Before it was pulverized, the monastery was a 27,000-square-foot stone and mortar building with 26 rooms, including a sanctuary and chapel, the AP reports. Alice says St. Elijah's, also called Dair Mar Elia, was a site of annual pilgrimage by the Christian community in Mosul, and that most recently, the ruin was incorporated into a U.S. base, where troops with carpentry skills were working to restore it. 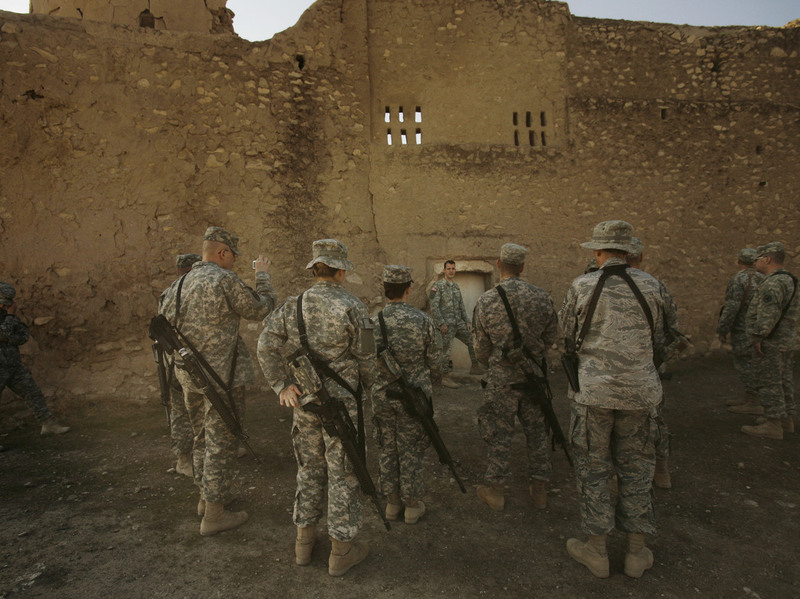 In this photo from Nov. 7, 2008, a U.S. Army chaplain leads soldiers on a tour of St. Elijah's Monastery on Forward Operating Base Marez on the outskirts of Mosul, Iraq. The monastery was apparently destroyed by ISIS in 2014. "The tow missile that crashed into the ancient chapel's wall could be chalked up to the fog of combat. But the same can't be said for the sophomoric graffiti scrawled around the place and the big 'Screaming Eagles' logo painted above the chapel's door. [...] Some of the damage U.S. forces did here can't be undone. But U.S. military chaplains are trying to protect the site as best they can during wartime." Then in June 2014, ISIS claimed control of Mosul and historical scholars and preservationists had been fearing the worst about the monastery's fate ever since. ISIS has killed thousands of people in the past two years as it fights for land and control in Syria and Iraq. Along the way, the group has also destroyed more than 100 religious and historical sites, including mosques, churches and shrines, that it considers incompatible with its version of Islam. Most notably, ISIS destroyed large swaths of the ancient Syrian city of Palmyra. As fighting between Syrian government troops and ISIS near Palmyra raged in May 2015, the UNESCO World Heritage Foundation pleaded with "all parties" to save the cultural treasure. ISIS captured Palmyra, and the requests were ignored. Militants took sledgehammers to statues and blew up temples. They also beheaded a renowned, 81-year-old Syrian archaeologist, Khaled al-Asaad, who refused to divulge the location of valuable antiquities — and then hung his body from one of the town's Roman columns. For a look at some of the other sites and artifacts destroyed by ISIS, check out this National Geographic article.